Gas Candy Cooker - Electric Stoves, Cookers & Mixers - Savage Bros.
A special configuration of the gas candy stove will incorporate an automatic gas valve controlled by temperature sensor with digital control. 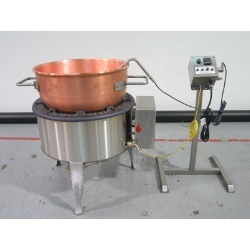 Works just like the big FireMixer - monitors the batch temperature, beeps when set-point approaches, and cycles the gas burner off/on to maintain the batch. For the #20 model, the digital temperature control is wall mounted or on optional stand. Temperature probe is designed for both kettle and Portable Agitator use. The larger #33 Cooker has an integrated operator control station and a lift-up temperature sensor with automatic gas-off safety feature. This is the same cooker as the S-92 FireMixer, without the agitator head. #33 Cooker incorporates larger #33 stove with integrated digital temperature controller and lift-up temperature sensor.